A collection of my favorite icing recipes. 2. Add the clear vanilla extract and combine well. 3. Begin adding in the sugar and mixing thoroughly after each addition. 4. After all of the sugar has been added and mixed thoroughly, begin adding the very cold milk… one tablespoon at a time, combining very well after each addition (mixer on medium-high to high speed) until you reach the desired consistency. 1. Cream butter in a mixer with the paddle attachment on medium speed. Turn off the mixer. Sift 3 cups powdered sugar and cocoa into the mixing bowl. Turn your mixer on the lowest speed (so the dry ingredients do not blow everywhere) until the sugar and cocoa are absorbed by the butter. Increase mixer speed to medium and add vanilla extract, salt, and milk/cream and beat for 3 minutes. If your frosting needs a more stiff consistency, add a little more sugar. 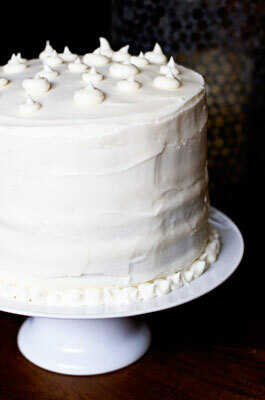 If your frosting needs to be thinned out, add additional milk 1 tablespoon at a time. 1. Cream butter and sugar until light and fluffy. Add milk and mint extract and mix well. You may want to add more or less milk. Add food coloring if you wish. Spread over cooled cupcakes and set in a cool place until frosting hardens. In a large bowl, beat butter and peanut butter at medium speed with a mixer until creamy. Add milk and vanilla, beating until combined. Gradually add powdered sugar, beating until smooth. In microwave-safe bowl, microwave marshmallow creme on high for 15-20 seconds to soften. Add butter and beat with an electric mixer on medium speed until smooth. Beat in powdered sugar and salt until smooth. Mix all ingredients using a stand mixer with a paddle attachment. Mix for 7-10 minutes — or until sheen has disappeared (finished icing should have a matte appearance). Store icing in air-tight containers. Thin with water until you reach consistencies appropriate for piping or flooding.